If you have TI-84 Plus calculator files that would be hard to replace, you need to learn how to use the Backup and Restore tools. If your rechargeable battery loses its charge, you are in real danger of losing the data stored in RAM on your TI-84 Plus. If your friend borrows your calculator and accidentally deletes all memory, how can you get your data back? The Backup tool can be accessed by clicking the Backup icon on the TI Connect Home screen. 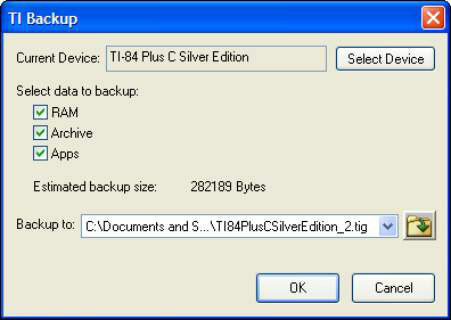 The Backup dialog box opens on the computer screen. Select the data you want to back up and choose the location on your computer where you want the data to be stored. The default location for your Backup data is: My Computer→My TIData→Backups. Click OK and wait for the selected data to be stored on the computer. The Restore tool can be accessed by clicking the Restore icon on the TI Connect Home screen. When the Restore icon is clicked, a window opens, prompting you to select the location where the Backup data was saved on your computer. After you select the location, you can select the data you want to restore in the Restore dialog box. Click OK to restore the data on your calculator.